Any of the millions of working-class citizens on the roads, by the drains, stuck in traffic or in the trains know that what keeps them going is the kind of food sold on the streets of Mumbai. And more often than not, the frenetic pace of life here ensures that one’s propensity for food is limited to the confines of their budget, being the one common thread that ties everything together, from your college festivals to even national taxation. And sometimes a lower budget means desperate measures to try and get the best bite for your buck. We pick out the best of the rest, to ensure your wallet’s sole hari patti gets you rolling on a full tank throughout the rat race. Located opposite the campuses of KC and HR College, Raju is a long-standing spot that has satiated countless students and workers from across the street and even beyond. While the joint is essentially a stall with no real place to sit, the fairly filling food and manageable prices more than make up for any shortcomings as there is a good range of sandwiches, pizzas and rolls to choose from. To handle the excessive spiciness of the food at times, Raju has an adjacent store selling colas, water and the like. Talk about preparing for contingencies! • Raju Sandwich, Churchgate. Opp KC and HR College. • INR 20-100. Serves rolls, sandwiches, pizzas and beverages. Situated in a line of shops opposite the famed Navjivan society in Bombay Central, Sadanand is no-frills in every sense of the phrase. Built just wide enough to accommodate a handful of tables at once, it may not look much at first glance. However, the Veg Thali that heartily fills you up for a ridiculously low price of Rs.80 is, IMHO, the best reason to turn up in hordes at this place. • Sadanand Veg Restaurant, Bombay Central, Opp. Navjivan Society. • INR 40-100. Serves Indian thali. 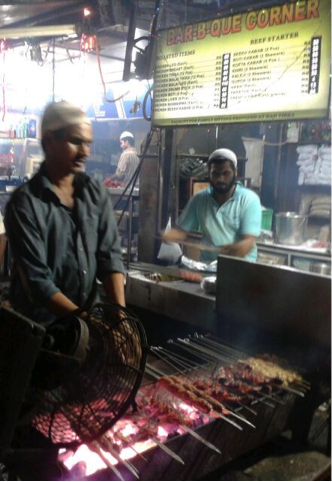 While the waft of freshly cooked meat attracts most of us to Minara Masjid particularly during Ramzan, Bar-B-Que is a far cry from the characteristic crowds and visibility of its peers. Tucked away in a lane opposite JJ Hospital, BBQ is a single stall opening up in the evenings and primarily for the late-night foodies looking for a bite. A range of kebabs and tikkas, right off the coals are available here at 30-70 bucks a plate. 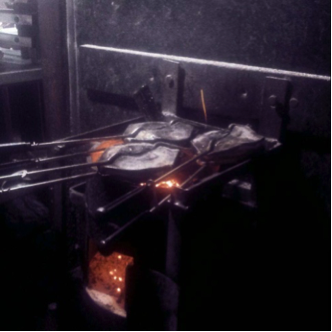 While hygiene is negligible, BBQ provides perhaps the most cost-effective kebabs, undercutting Shalimar’s prices and beating Minara’s delivery time. • Bar-B-Que Corner, near Bohri Masjid, Opp. JJ Hospital, Mohammad Ali Road, Byculla. • INR 30-70 a plate. Serves chicken, mutton and Chinese dishes. A stone’s throw away from Harkishondas Hospital, Shalimar Juice Centre (also called Patil juice centre to avoid confusion) is a popular haunt for the nearby offices and Hinduja College. 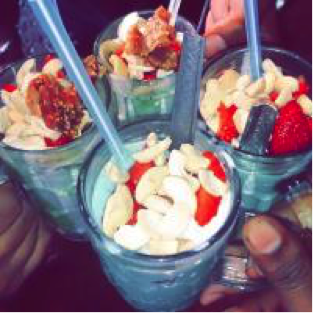 Serving a variety of juices, shakes, fresh fruit, mocktails and ice cream, Shalimar starts off late and runs late into the night to cater to patrons. Prices range between Rs.40-200, with each glass being as freshly extracted as they come and providing complete value for one’s money. A non-descript joint in an alley next to Bombay Scottish School, Shree’s is the perennial go-to for Scottish students, locals and even people working in the area for some of the best rolls in Mahim. 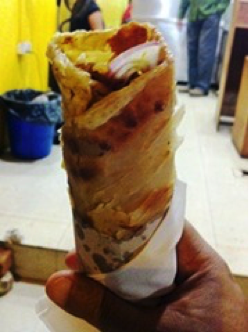 A step up in hygiene from the stalls lining Mahim Dargah, Shree’s chicken and egg roll is known to be a must-try. Besides, it has a good range of vegetarian rolls as well, remaining open for most of the day. For those of us unwillingly to down the coffee at Starbucks Khar, lies an alternative down the lane that’s one of the oldest in Bandra. 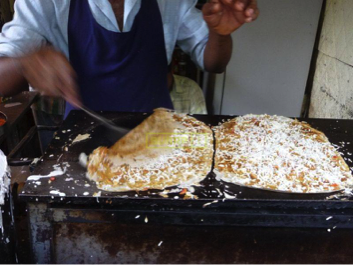 Manju Dosa, initially started by a Mysore-based cook, serves a huge range of dosas out of his tiny kitchen to the throngs of people waiting outside. With prices from Rs.20-100 per plate, a characteristic crispness and spicy chutney served alongside hot dosas, Manju Dosa continues to be a favorite for Bandraites looking for a cheap, filling bite instead of the hordes of flagship restaurants along the suburb. • Manju Dosa, 14th Road, next to Starbucks, Khar (W). 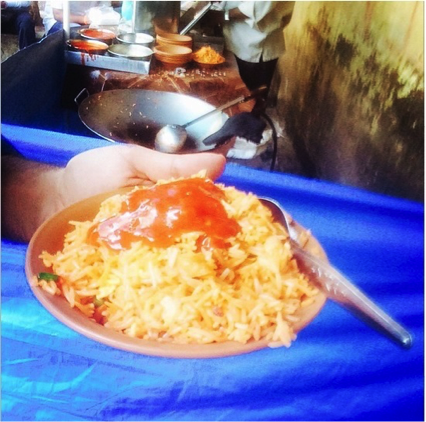 Ravi Rice has been around longer than most students and staff in the 4 colleges lining Linking Road, Bandra. The stall serves Chinese right off the wok, with rice, noodles or a combination of both ranging from Rs.40-80. It allows the quintessential ‘one-by-two’ lessening the cut into one’s pockets and lets you take generous helpings of schezwan sauce, with ‘eggs-on-top’ of your dish if requested. Known for being the spiciest among the lot of stalls, Ravi Rice has braved through years of existence and continues to serve students every single day! • Ravi Rice, in front of Next to MMK College, Linking Road, Bandra (W). • INR 40-80 for a plate, serves Chinese. 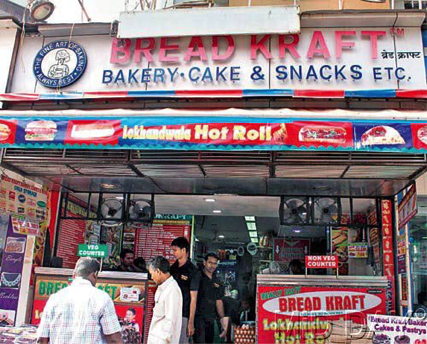 Starting with humble origins in the Lokhandwala market, Breadkraft is now a landmark in the crowded, bustling Andheri neighbourhood. It is renowned for its heavy-on-the-stomach, generously made frankies ranging from 100-180 bucks a roll. Akin to a full meal, Breadkraft is not for those who are conscious about greasiness and proportions! It also has a well-equipped general store selling confectionary and bakery items. • Breadkraft Hot Roll, Lokhandwala Market, Andheri (W). • INR 100-180, serves frankies, confectionary and baked items. One of Matunga’s oldest cafes and reminiscent of its South Indian lineage, Café Madras is filled with all kinds ranging from elderly locals to the odd student looking to grab a quick cuppa of its famed Filter Kaapi. It serves one of the most authentic South Indian cuisine, ranging from appams to idli cooked in styles most mainstream restaurants avoid. Crowds mean some waiting usually occurs in the evenings or weekends, but the light, filling food and even lighter prices make it worth sticking around for. • Cafe Madras, 38 B, Circle House, King’s Circle, Matunga East, Mumbai. A few footsteps away from SIES College, Sai Krupa is a favorite not just for students but also families and the general public looking for snacks and with reasonable hygiene and cost. It serves typical street foods like Bhel, Sevpuri, Ragda Pattice, Chole Tikki, Pakode alongside items like Pav Bhaji and even authentic North Indian food. Priced between 50-180, Guru Kripa is family-friendly and a good bet particularly if you place ambience and seating over quick serving, although it delivers reasonably well on both! • Guru Kripa, 40, Guru Kripa Building, Road 24, Near SIES College, Sion. • INR 50-180. 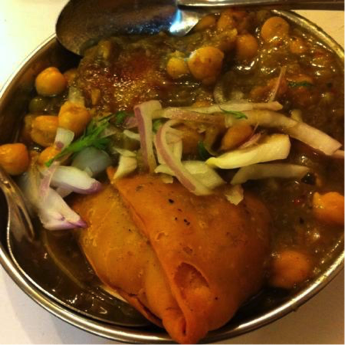 Serves Chaat, south Indian and North Indian cuisine. One of Mulund’s oldest joints, Tarkeshwar started as a stall and now holds its own place, complete with kitchen and grille. Starting late in the afternoon and ending business in the wee hours, it serves sandwiches of all types, most notably its Chilly Cheese and the Chocolate-Butter grill that are in high demand at all times, with the Chocolate sandwich running out before the day ends often! Complete with fiery green chutney (characteristic of Mumbai street food), Tarkeshwar gives patrons the real bang for their buck, with generous helpings and prices from Rs. 30-100. • INR 30-100, serves sandwiches, frankies and beverages. With places tucked in nearly each corner of the city, its time to stop reading and start feeding!